I would like to teach you very conversational casual Japanese contraction today. Casual contractions are considered to be bad grammar and many language experts criticize it. However, we say/hear that a lot in conversation and you will see it in casual writing. Japanese people don’t always talk or write the way you learned in textbooks. So when you hear/see something that is different from what you have learned, you may get confused. 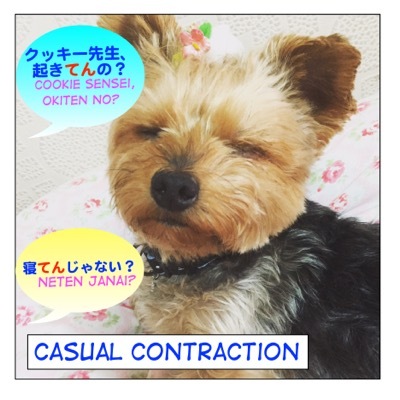 Many Maggie Sensei students have asked us about contractions in the comment section. While it is technically grammatically “wrong”, I wouldn’t say it is bad language. It is a little like “wanna / gonna” in English. And like contractions in other languages we use these Japanese contractions simply because they are easier to pronounce. You don’t need to actually use these forms, and I would advise against avoid using them in your Japanese class. But I think you’ll find them useful to know. = Gakkou ga owattara kouen de matte iru ne. = I will wait for you in the park after school. = Gakkou ga owattara kouen de matterune. ＝ Anohito, zutto kocchi no hou wo mite iru yo. = He/She/ That person has been watching you for the whole time. = Anohito, zutto kocchi no hou wo miteruyo. = Kanojo wa mukashi, issho ni asonde ita tomodachi desu. = She is a friend I used to play with long time ago. = Kanojo wa mukashi, issho ni asondeta tomodachi desu. = Mou sanjuppun mo matte iru no ni konai kara saki ni tabete iru ne. = Since you have kept us waiting for 30 minutes, we will go ahead and eat, OK? = Mou sanjuppun mo matteru noni konai kara saki ni tabeterune. = Mainichi, hashitte iru noni chittomo yasenai. = Though I am running everyday, I can’t lose weight. = Mainichi, hashitteru noni chittomo yasenai. = Dou, saikin, nihongo no benkyou shiteiru? = Hey, have you been studying Japanese lately? = Dou, saikin, nihongo no benkyou shiteru? = Onna gokoro ga wakatte inai naa. = You don’t understand women’s mind. = Onnagokoro ga wakatte nai naa. = Kinou wa zenzen, nete inai kara, kyou wa nemui. = Since I didn’t sleep at all yesterday, I am sleepy today. = Kinou wa zenzen, nete nai kara, kyou wa nemui. = Densha ga konde ita kara suwarenakatta. = The train was crowded so I couldn’t sit down (on the train). = Densha ga kondeta kara suwarenakatta. = Kare no kimochi wa yoku wakatte itaga nani mo ienakatta. = I understood well how he felt but I couldn’t say anything. = Kare no kimochi wa yoku wakatteta ga nani mo ienakatta. = I didn’t think that far. = Kyou, uchi de yuugohan tabete iku? = Do you want to have dinner with me at my place? = Kyou, uchi de yuugohan, tabeteku? = Ame ga furukamo shirenai kara, kasa wo motte itta hou ga iiyo. = It might rain so you should take an umbrella with you. = Ame ga furukamo shirenai kara, kasa wo mottetta hou ga iiyo. Please read or review that lesson if you need to. = Doko de hataraite iru no? = Where do you work? = Doko de hataraiten no? = Watashi ga itte iru koto wakatte iru no? = Do you understand what I am talking about? = Watashi ga itteru koto wakatten no? = Mata aitsu kiteiru na. = He is here again, huh? = Mata aitsu kiten na. = Kondo no nichiyoubi wa nani wo yatte iru no? = What are you doing next (or this coming) Sunday? = Kondo no nichiyoubi, nani, yatten no? = Ima, donna hon wo yonde iru no? = What kind of book are you reading now? = Ima, donna hon, yonden no? = Dare no koto wo, kangaete iru no? = Who are you thinking about? = Dare no koto wo, kangaeten no? = Itsumo Maggie no koto bakari kangaete iru yo. = I am always thinking about Maggie. = Itsumo Maggie no koto bakari kangaeterun dayo. = Mou dekakete iiyo. Ato wa katazukete oku kara. = You can leave now. I will take care of putting things away so…. = Mou dekakete iiyo. Ato wa katazukettoku kara. = Cookie Sensei ni shukudai herashite tte itte oku kara. = I will tell Cookie-Sensei to reduce the amount of homework, OK? = Cookie Sensei ni shukudai herashite tte ittoku kara. = Ima wa, musuko ni sukina koto wo yarasete okuyo. = I will let my son do whatever he likes for now. = Ima wa, musuko ni sukina koto wo yarasetoku yo. = Ano zasshi, katte oita yo. = I bought that magazine for you, you know. = Ano zasshi, kattoita yo. = Maggie sensei, ressun, tsukutoita yo. = I went ahead and made a lesson for you, Maggie Sensei. = Cookie, Okite! Tsugi no ressun mo tsukuttoite yo. Maa nesetokou kana. = Wake up, Cookie! Prepare the next lesson as well. Oh well, I guess I will let him sleep. Are you using this device? A1. I am not using it. A2. I will not use it. / I don’t use it. The question is “Are you using ~” so you have to match the answer. I am not using it which is A1. Ah, I see. But I still think B is unnatural. 〜しておく is used when you intentionally do something ahead of time. される is a passive form so using them together is unnatural. Hi! This lesson is so helpful! Thank you! P.S. The “の to ん” lesson link is broken. Thank you, Maggie sensei! Yeah, I’m still newbie on Japanese, and I found this greateful website. This is very helpful, you know! Happy to hear this site is helpful. Hope you keep learning Japanese with fun! Thank you so much Maggie sensei. Now I understand. Thanks for your fast reply and I’m sorry I didn’ know about this lesson before. Hi Maggie sensei, could you translate me this sentence? I don’t understand very well the meaning of もったいない here: もったいないと思うとなかなか捨てられない. So もったいない is the feeling that you don’t want to waste something. I have a lesson so please check it. Teru ga teku mitai, toku no “slang” ga “verbs ending with de in their te form” de tsukaemasuka? Some typos, funnily all extra syllables. You have to contract your romaji too, you know! 1. まあ、寝せとこうかな。What kind of contraction is that? 寝させとこう (寝させておこう) I would understand, so is 寝せる the “さ抜き言葉” of 寝させる? 2. I recently saw 出てけば translated as “Go!”. Is this a contracted ba-form, and if so, I still don’t get the translation? 3. Concerning contracted -ba forms, I often hear it for 一段 verbs (z.B 見れば–>見りゃ), and in some expressions (そうすれば–>そうすりゃ;　そういえば–>そういや), but I wonder, can you use them for all 五段 verbs as well? If so, what would the forms be for 買う、帰る、待つ、話す、書く、泳ぐ、飲む、遊ぶ? Thank you so much for spotting the typos. I fixed them. This I heard all the time and never was sure what grammar they represent. The hyperlink to “～ておく” is broken.